(1956, Black & White, Sci-Fi, Venus, Carrot Monster, Roger Corman) "Every Man Its Prisoner... Every Woman Its Slave!" A carrot from Venus enlists the aid of scientist Lee Van Cleef in order to save mankind, through the strategm of attacking them with string-borne, mind-controlling bats. Hero Peter Graves reminds us at the end that Van Cleef learned almost too late that man is a feeling creature.... With the short Snow Thrills, about winter sports. Shields up, red alert! In addition to containing Peter Graves, Lee Van Cleef, and the most insufferable ending monologue in MST3K's history, it's the first movie we've gotten from our heroes' long-recurring nemesis Roger Corman! YouTube (1h37m) First shown August 8, 1991. "A well meaning scientist guides an alien monster to Earth from Venus, so that he can rid mankind of feelings and emotions - but only death and sorrow results." Directed by Roger Corman. Written by Lou Rusoff. Starring Peter Graves, Beverly Garland and Lee Van Cleef. This week's showing, barring unforeseen circumstances, is tonight (Thursday) at 9 PM Eastern time. The showing will again be at http://sync-video.com/tv/rodneylives. 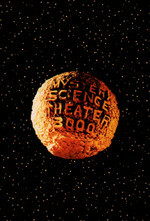 The basics of our weekly MST3K showings are in the MST3K Club FAQ. ". . . and then I'd call Pup Tentacle and ask 'im how's 'is chin. I'd find out how the future was, 'cuz that's where he's been. His little feet got long and flexible and suckers fell right in. The time he crossed the line from later on to way back when . . ."
"Did you ever see that one? The monster looks sort of like an inverted ice-cream cone with teeth around the bottom. It looks like a teepee or sort of a rounded off pup-tent affair, and, uh, it's got fangs on the base of it, I don't know why . . . and there's this one scene where the monster is coming out of a cave . . . There's always a scene where they come out of a cave . . . just over on the left hand side of the screen you can see about this much two-by-four attached to the bottom of the thing as the guy is pushing it out, and then obviously off-camera somebody's goin': "NO! GET IT BACK!" And they drag it back just a little bit as the guy is goin': "KCH! KCH!" Now that's cheepnis. "And this is "Cheepnis" here. One two three four . . ."
I just realized it today, but the Satellite News episode guide updates are perfectly in sync with our schedule, if you want to look at "recaps" before the show. Sure, this ep is Peter Graves-ish, but Beginning of the End is the Peter Graves-est. "He learned too late that all his struggles were extremely riff-able." This was the first time I could join the live show and it was great! Thanks everyone. Thanks for coming by, and hope to see you next week, because wow, GAMERA VS GUIRON is one of the most inexplicable movies in MST history. Also I think the skit where they parrot the dinner banter but then it slides into outright insults is just the best. This is the sketch Monochrome is referring to, which I agree, is one of the best host segments they've done. Very tightly written. The whole bit is transcribed over on the Satellite News' obsessive subsite Ward E.